With a body type like a tall camel and spots like a cheetah the giraffe – despite its height was surprisingly elusive in the wild. You’d think that spotting their heads above the trees would be easy but alot of times they have their heads slightly bowed as they are constantly eating. However, when we did find them they tended to be in tight knit groups with a couple of adults and baby/small giraffes with them. They were more skittish than I expected and often took off when the safari vehicle would stop a little too close – they were surprisingly fast. Our guide did use the giraffes to track the lions though since you can follow their eyes to locations of dangerous predators – which for adult giraffe is really only a lion. 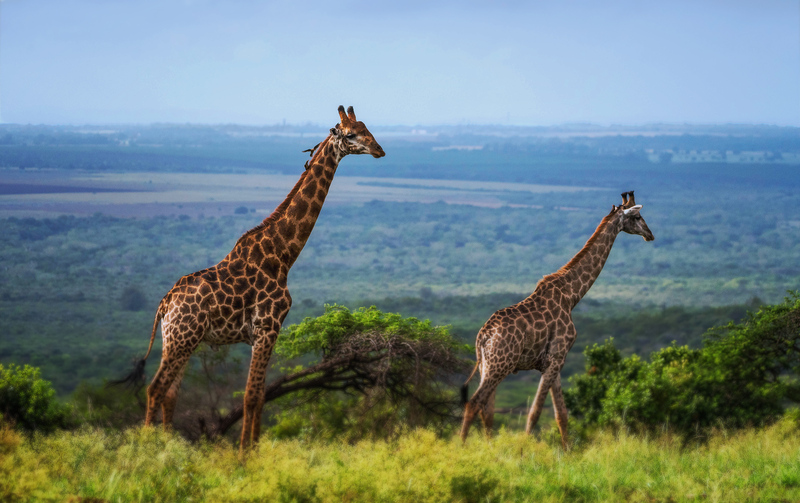 Smaller giraffes are hunted by other big cats – like the cheetah – but once they are of substantial size they are a tougher target unless the cats are extremely desperate. I took a lot of pictures of giraffes but I liked this one because of the openness of space behind it them heading into the distance. There is really so much land out there supporting the wildness of all these species. It was a great experience to watch the animals behave in the wild compared to just seeing them in a zoo. 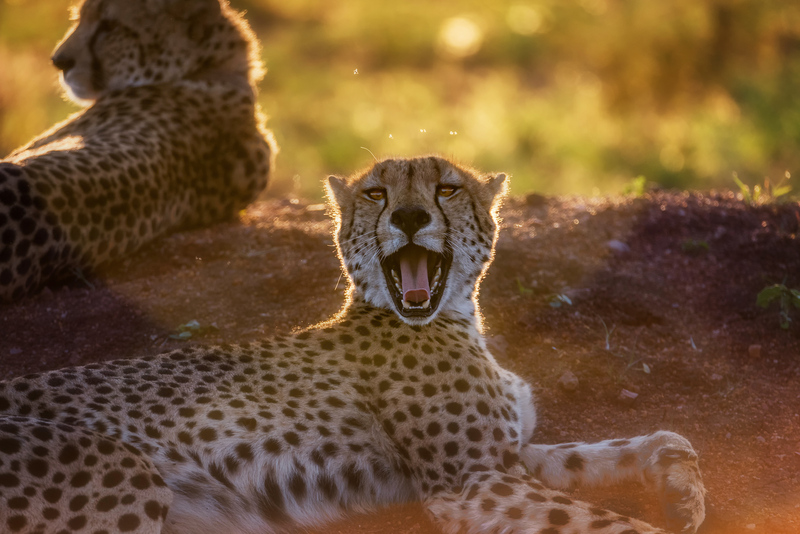 While in Phinda our driver/game tracker was able to locate two cheetahs out hunting and we followed them for a bit – hoping to see some action on the trip. We kept a respectable distance to allow them to do their thing but ultimately they wound up just heading up to a lookout point and waiting for the sun to set – whether they were going to hunt later is something we weren’t able to witness. As they strolled over to an elevated position we watched just how relaxed they were as if they didn’t have a care in the world. Unfortunately, the cheetah is on the ‘vulnerable’ species list so while technically not ‘endangered’ they are on their way. It isn’t for lack of effort by South African officials and fortunately for them game drives like ours and people who are truly interested in seeing them aid in their recovery. 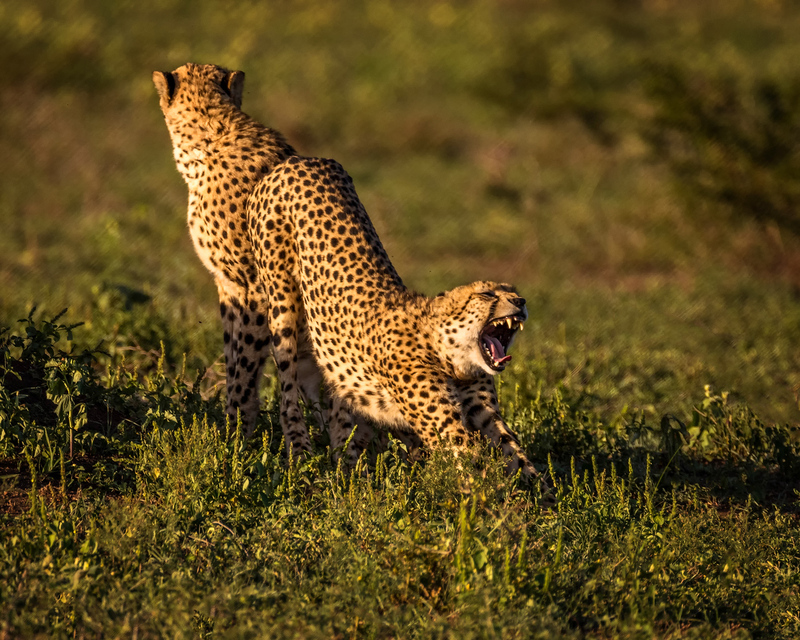 However, our guide explained that relative to other ‘big cats’ cheetahs are just a disadvantaged species and despite their speed are unable to overcome both poaching and competition with other big cats – lions, leopards, etc… – which have done better in what is an ever shrinking ‘wild’ footprint. Phinda is a private game reserve and as such has a vested interest in protecting them. I believe they have 33 cheetahs spread over 175 square kilometers and the trackers/guides keep a close watch on them. This cheetah made me feel lazy just sitting in the safari jeep as he practiced some high intensity yoga in the late afternoon heat of Southern Africa. Shortly after this house cat like pose he and his brother started over to a termite mound where they waited for the sun to set and the tourists to leave so they could go about hunting. Before going to Africa I rented a lens from Borrowlenses.com and it sure did come in handy. The Tamron 150mm – 600mm lens was a (relative) bargain compared to some of the more ‘professional’ lenses and it worked great even in low light at the end of days while we tracked tiger cubs in the bush of Phinda Game Reserve in South Africa. Our guides on this excursion were great and in Phinda (unlike in our game reserve) the guides are able to off road and track the animals throughout the bush. Our guides followed the footprints of this family of lions and located them lounging underneath a tree. Due to the cubs being in the area we couldn’t get very close to them since the female and younger males were protective of them. 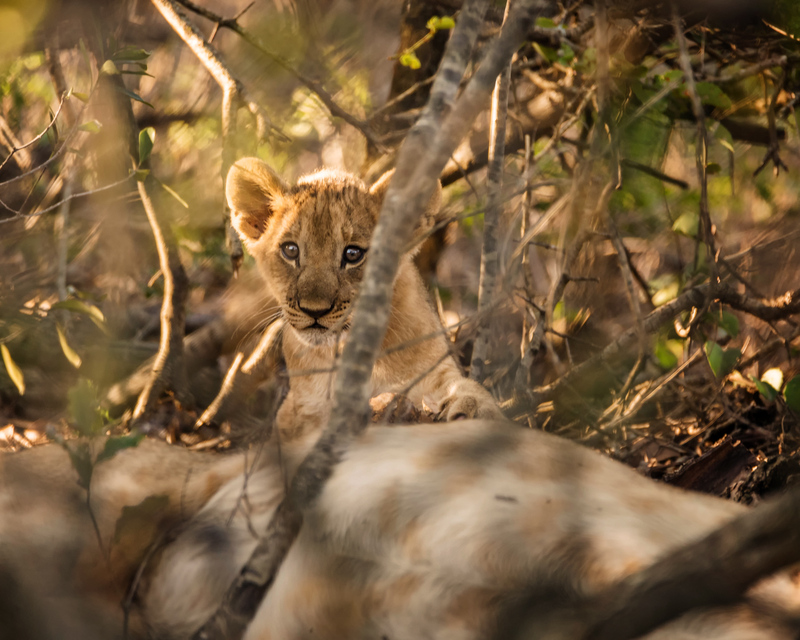 Thus, we kept a respective distance and I focused through the trees on the cubs to try and capture their expressions as they wrestled with each other and climbed trees in the background. The Tamron lens did its job and I came out of the situation with a lot of nice shots (like the one below) where the curious cubs are trying to figure out what it is that the weird humans ooohhhing and ahhhhhing are doing. We are just getting re-settled after our trip to Africa to visit Cape Town, Victoria Falls and go on a Safari. During the safari we came across many several different small herds of elephants. 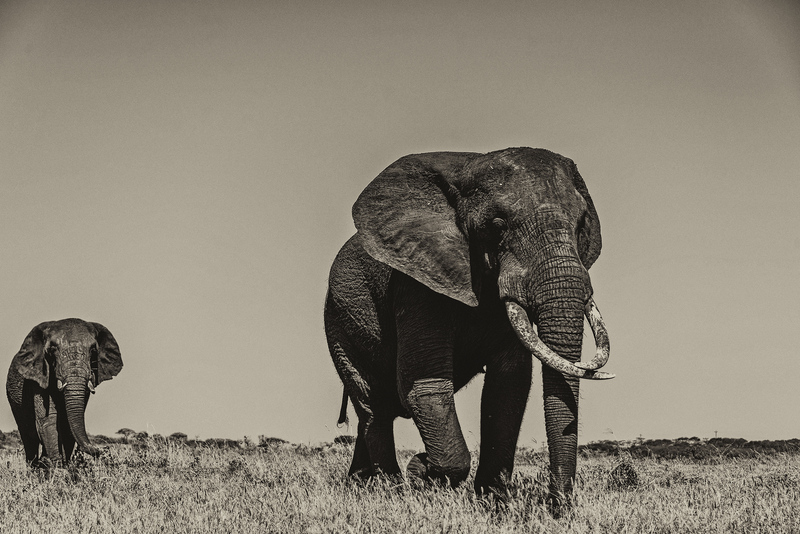 Before going over there I envisioned capturing a nice wide shot of a large herd of elephants (30 – 40 different elephants) but that never happened and I think it is because herds tend to be smaller in South Africa compared to other locations on the continent. I am not really sure why that is but that is the impression that I got from talking to our guides throughout the week.